Despite all the changes to the iPhone and suggested improvements to the app, the developer hasn’t done anything in 2 years. Still issues with date formatting, still issues with Out of Office, still no iPhone X series support. Every time I respond to an email, the app allows me to write about 6 words before it crashes. We obviously need an update here but there doesn’t seem to be anyone working behind it. Wouldn’t buy again. I have been experiencing an issue with this app crashing and no longer being able to refresh It has not refreshed in two weeks now When this has happened in the past I have had to uninstall and reinstall to get it to work properly HELP!!! When will Mail+ Support the screen dimensions of the X? It can't be that hard. 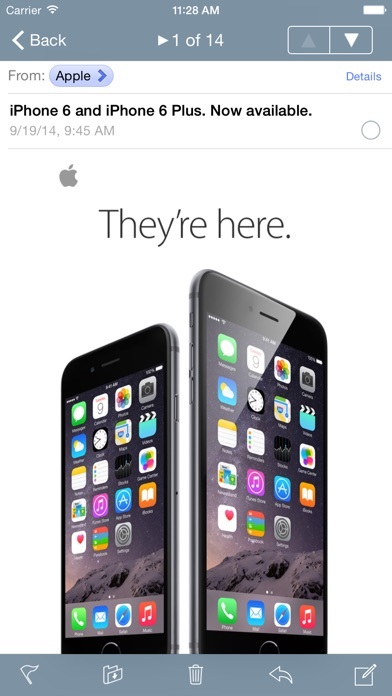 The X isn't going away. App constantly crashes, especially when performing searches. I purchased this App because the MS Outlook App does not let you change the default “Reply to All” button on received emails. 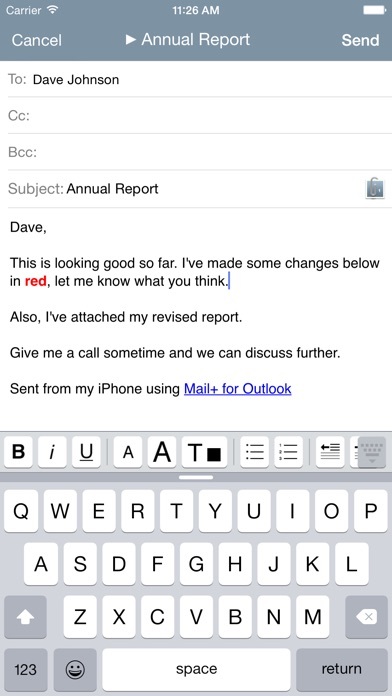 This app does a great job with Outlook integration and does take the Outlook for iOS and to school on many features. But, I wonder if this app is being actively developed. Their Twitter timeline seems dormant. I would like to see new features added! The app is very useful as I cannot use the outlook app for my work email but it works great with this app. All I ask is that y’all please update it to fit correctly with the iPhone X. This app hasn’t had an update in over a year. Give it some love PLEASE! The new update for Apple watchOS 4.3.1 doesn’t sync with phone. Overall the best outlook app I ever used. Only request I have if it’s possible to have the option to change the background color theme or borders as well. Thanks for developing such a great mail app. I love this app but I would like to see a new feature. I make folders for all of my emails to stay organized. Unfortunately I cannot access the emails that I file in the file folder on my phone. I have been using for work email for a few years now. It is the app out I. T. guys use but are supposed to recommend the outlook app. Cannot look at more than one mail in box at a time. I prefer to see multiple email accounts/calendars as well I like to see all my contacts in one like without sorting through personal vs company vs recent contacts. This is the problem with app’s that don’t provide a trial period and want their money up front. Wish I could get a refund. I would rate this a do not buy. Have been using this app now for over a year and the ease of use along with the ability to sync with your email contacts/calendars makes this app to the top of my list. My office currently uses Good and this is a breath of fresh air allowing me to work as I travel away from the office with no issues. I highly recommended this app just wish they also offered it for the Android too. The app doesn't have the basic feature of 'select all' to delete multiple emails at once. Regret my purchase. This has been so frustrating. App works great with the exception of crashing when searching previous emails and trying to view and reply to them. It crashes before you can do anything. I have notified support numerous times but problem never gets fixed. Now I am getting duplicate emails. I would not recommend this app. It appears they are not interested in fixing their problems. Worked until April 2017. Waste of money. I was about to give up hope of ever finding an app that could access my work OWA email. I am so glad I decided to try one last app. Not only does this access my work email, but it is extremely easy to set up and use, it has a simple and organized interface, and will even open emails and attachments faster than my computer at work! I can honestly say this is one of the best apps I have ever purchased. Both my wife and have an iPad Air, with this app for our work email. But, we can no longer use this app since it stopped updating our received emails. The date last updated was 1/16/18. No idea what happened to this app, but the email still works fine where we work at a large hospital. I installed the Mail+ app to connect with my Exchange mail at work. It has all of the basics: email, calendar, and contacts, but if the developer added sync scheduling and TouchID unlock, that would make it better. I use Nine on my Android device, but it does not support landscape screen layout for iPads, so Mail+ fits the need. I am a little concerned that Mail+ development seems to have stalled though. I loved this app when I first got it about three years ago, but it has gotten more and more difficult to use with each passing year. My app folders no longer match my computer email folders so searching for emails has become difficult...if I can get the app to open at all...sometimes the app won’t even open, let alone load my emails. It does Everything it promised, and even finds my Exchange names slicker than slick. Thanks! This app have never operated Smoothly for me. Crashes or is slow to process searches. Please fix. It is very frustrating. App will not refresh, need this fixed ASAP!! When it’s working it’s great, but it needs fixed!! This app continuously closes out every time I start a reply message. It is so frustrating. I wish I could get my $5 refunded. No question it did bog down on contacts, but that doesn’t seem so much an issue now. It makes my working life much easier. I can easily give a five star review because of the ease and efficiency. Works great and is fast! 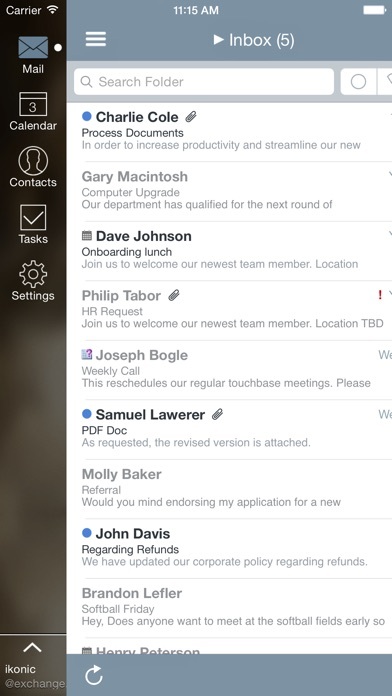 There are not May mail and calendar apps that will sync with corporate mail servers! I had Newton and this is just a great. This was one of two emails options to get my work email. I do like it, but would like to go to delete email as a option. Another issue that I had was when I changed passwords at work I had trouble with receiving new email still having issues with it. Nope, NOT usable if you need to search for anything. Delete! This is the best app for outlook mail. Please update for new iPhone XR. Not filling the screen completely. 4 stars just for that reason. 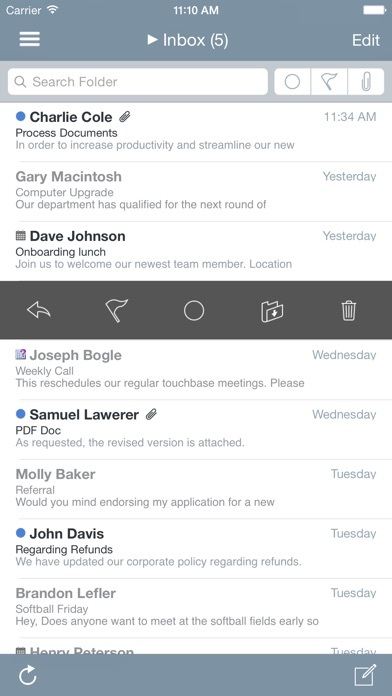 Perfect email client aside from the black bars I get in my iPhone X. Please update! Everytime I set notifications only for calendar reminders I still get email notifications. Tried to add a Evening meeting to this calendar and all I got was cancelled failed to add to calendar. So… i’ll have to find another calendar. 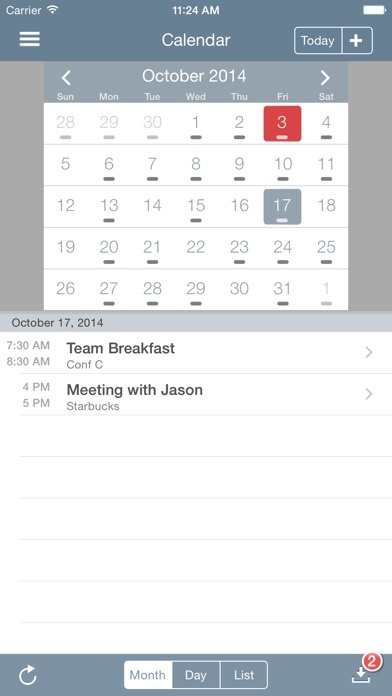 I need a calendar separate from my personal day to day calendar to tract school related meetings. It seems the developer is no longer supporting this app. It used to work great but now I can never get it to refresh. I have to quit the app and then reopen to get emails to show up. Notifications no longer work or are sporadic at best. It’s too bad. This was a great app. No update in 2 years to address chronic issues? Updating to a lower a star and deleting the app. 0 star rating. Unreliable and glitchy to say the least. The program freezes often and closes itself when doing tasks. The "search" tool does not work and can't pull up an email if you enter the title or sender. Crashes every time I search for deleted email, and when looking for employees through the server. The app deletes data from previous emails when responding to a message with dates or times in the previous email on the thread. This has created many problems for many people, since the app completely omitted most of the data from prior emails. For a paid app, I expect it to work better than a standard mail app, but have been constantly let down. Do not waste your time. Great MS Exchange Server App includes Calendar! Update. 4 stars. 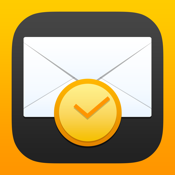 In order for app to auto check for new emails the app must remain open, and will do so for maximum 10 minutes per FAQ. In order to synchronize after 10 minutes must re-open app because account credentials not stored on Mail+ gateway mail server. Also newly added calendar event has no option to specify advance reminder notification, only has reminder at event start time. Tested ok that app does not need to be running active for event reminder to appear after 10 minute mail manual check threshold. after searching a year found this compliant Mail+ Exchange Server mail app that syncs with the calendar! Bonus is easy to search for contacts. Prior iOS mail apps including one paid that stated it could but didn’t that I tried either would not authenticate the account credentials, could not show the calendar so I missed appointments! Worth the $5. Thanks!!!!! I find that I receive less spam mail than from other email services. Easier to use and download pics or attachments. Thanks. I have the iPhone X on iOS 11.2 and the application is dropped and does not take advantage of the screen size - can the developer please update this great app?